Today is all about the distinctly delicious flavor of Cajun Country! Packed with good-for-you ingredients, this version of a Louisiana classic side dish is hearty enough to stand on it’s own as an an entree.For a touch of sweetness to complement the fiery flavor, serve with a side of biscuits brushed with a mixture of 2 T butter, 1 T honey , and a dash of salt. Hungry for more? Follow me on Pinterest for lots more recipes and meal ideas! In a large pot, heat the olive oil over medium heat. Add the onion and sauté 1-2 minutes, until slightly softened. Add the garlic and Cajun spice. Cook and stir another 1-2 minutes. 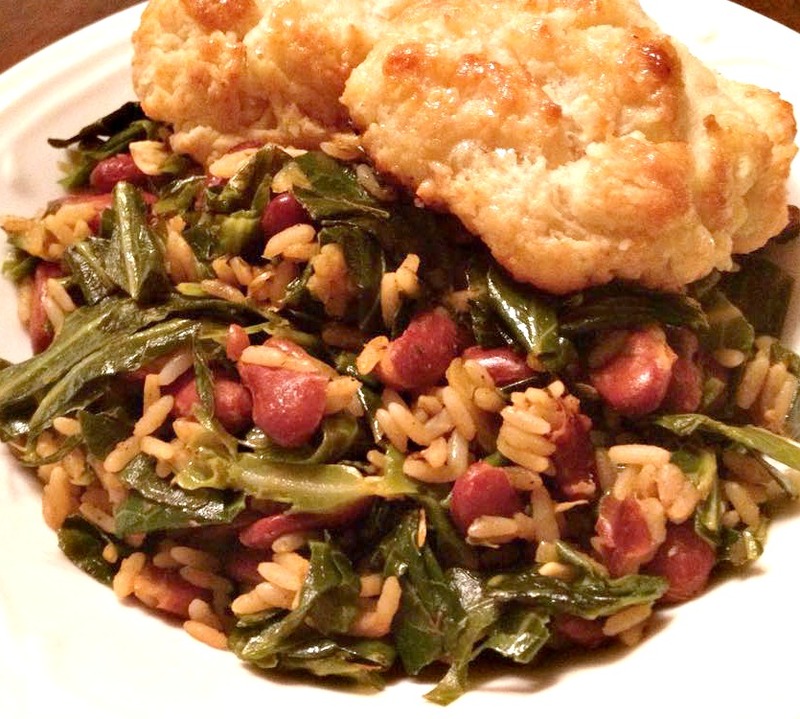 Place collard greens in the pot along with 2 Tablespoons water. Continue cooking, stirring occasionally, until greens are wilted. Add beans and rice, plus 1 cup water, to the pot. Cover, reduce heat to low, and cook 15 minutes, or until the liquid is absorbed and rice cooked through. Adjust seasoning, sprinkle with cayenne pepper sauce to taste, and serve warm. Recipe adapted from Blue Apron. Looks so delicious! Definitely will be trying!